OXFORD, Miss. – Negotiation skills, competitive pricing, lunch etiquette, business plans, the importance of a proper handshake, proficiency in Excel, and commercial development and filming were just a few of the opportunities offered to a group of middle schoolers recently at the University of Mississippi. The activities were part of StartUp Camp, sponsored by the university’s McLean Institute for Public Service and Community Engagement and the Center for Innovation and Entrepreneurship. The students, all sixth- through eighth-graders, were from Como, Lambert, Marks, New Albany, Newton, Oakland and Sardis, as well as Lakeland and Memphis, Tennessee. The young professionals kicked off the week learning the four basic types of businesses: manufacturing, wholesale, retail and service. After the students decided on the business they wanted to develop for the week, they quickly jumped into negotiations – the cornerstone of almost any business. Jessica Clarke, a camp leader and recent UM graduate in integrated marketing communications from Nashville, entered into a negotiation about a calculator with Kevin Hernandez, a rising seventh-grader at New Albany Middle School. Ultimately, Hernandez agreed to pay Clarke $9.50. “She started at $15 and I countered with $6,” said Hernandez, whose business is a 24-hour-day medical clinic and drugstore called “Life Saver Clinic and Drugstore” with free flu shots and price-matching minus 20 percent for B-12 shots – services to attract customers. Verkeria Price, a rising eighth-grader at North Panola Junior High, was chosen by her school’s guidance counselor to attend the camp along with classmates Shaniyah Brown and Sabria Henly. Price’s business, “Curl Me Crazy,” is a hair salon. “The McLean Institute is pleased to partner with the CIE to offer this entrepreneurial camp for secondary school students,” said Albert Nylander, the institute’s director. “Since 2014 McLean’s Catalyzing Entrepreneurship and Economic Development program (CEED) has invested $1.6 million into the Mississippi economy and provided academic scholarships to more than 50 UM students. 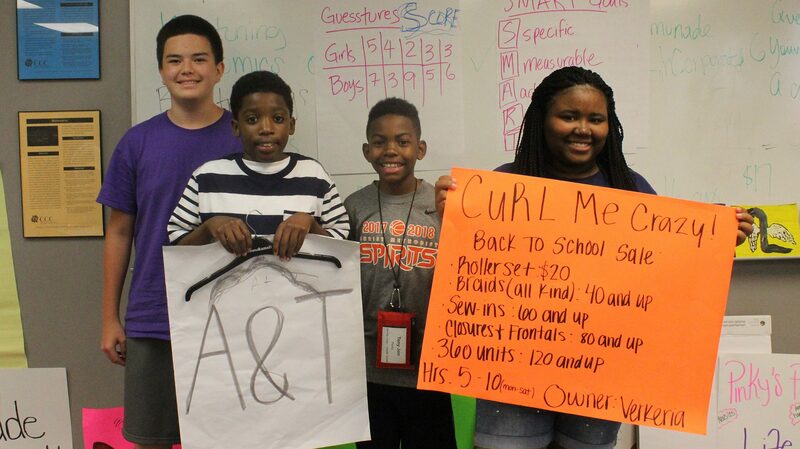 Andrew Wharton, a rising seventh-grader at Grace St. Luke’s Episcopal School in Memphis, and business partner Tony Parks, a rising sixth-grader at Christ Methodist Day School in Memphis, were busy scripting the commercial for their business, “A&T Hangers,” a clothing hanger recycling business “kind of like eBay,” Wharton said. “We pay for the containers, and then we pay a reduced cost for the hangers – depending on the condition – and then we sell them back to the cleaners,” Wharton said. “I have learned teamwork and how to come up with a cool business idea that is also environmentally responsible,” Parks said as the two partners headed out to film their television commercial with Hernandez. The judges for the camp were Clay Dibrell, UM professor of management and CIE co-director; Allen Kurr, vice president of Oxford-Lafayette County Economic Development Foundation; Robert Patterson, a graduate student in health promotion and a CEED Innovation Fellow; Armegis Spearman, learning specialist at the UM FedEx Student-Athlete Success Center; and Lynn Woo, research associate in the UM Center for Population Studies and the State Data Center of Mississippi. “Leading these young entrepreneurs through the experience of starting a business has allowed me to witness a powerful transformation in these children,” said Ashley Bowen, program coordinator, a CEED Innovation Fellow from Lambert and an Ole Miss graduate student in computer science.